It was mid-January and the weather in Florida was a modest 20°C on a sunny opening day of the 2009 Sporting Hunting and Outdoor Trade Show. 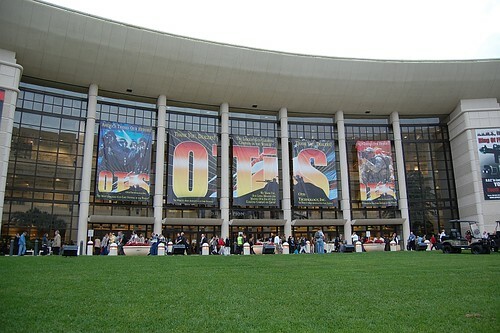 The SHOT Show is basically a huge gathering of manufacturers, distributors and wholesalers that are vying for business of outfitters, dealers, retailers, as well as military and law enforcement divisions. This show was my third in attendance and as a firearms enthusiast, coming to these shows is akin to being a kid let loose in a candy store. Firearms of all types of configurations are present as well as a huge selection of accessories, as well as cooking marinates, clothing manufacturing, and outfitters are found here. It is indeed the largest trade show of its kind in North America and every gun enthusiast should try to go once in their lifetime. One word of warning, bring comfortable, supportive shoes, as if you want to just stroll around aimlessly you can easily spend two days just admiring all of the products from a distance. As usual, all the big name players in the world of firearms were in attendance, displaying their wares and newest designs. Add in the all the associated manufacturers of accessories, reloading components, and targets and you have only accounted for about half of the show. That is correct, only half. Clothing, survival gear, food preparation, knives, cleaning supplies, paintball, storage, make up another quarter of the show. You may be saying that the writer obviously cannot add because that only equals three quarters of the show. You would be right on the latter point, as the remainder of the show is dedicated to law enforcement and military suppliers. 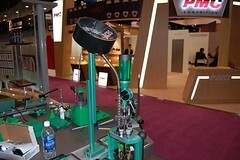 As an all encompassing show, the sheer variety and scale of the manufacturers, distributors, and suppliers is staggering. Over 1750 different companies at the show who shared over 700,000 square feet of floor space to display their merchandise and services to some 48,000 attendees. Some or you may be scratching your heads in wonder at all those companies setting up for a mere 48,000 attendees, when Canadian events akin to the Toronto Sportsmen’s Show attract over 120,000 people in the same time frame. The big difference is that the SHOT Show is not open to the general public, which means that those 48,000 attendees were dealers, retailers, buyers, media, and representatives of shooting/training facilities. The total numbers for this year added up to 48,907 people who were at the show itself. This year was surprising in one fact, there were very few overall new products introduced as compared to the last few years. Previous shows had new products such as Ruger’s SR9 handgun, Magpul’s Masada rifle, Keltec’s RFB, and it seemed that many companies were bringing out new innovation to their products. This year I would say that there were not as many new items out there in regards to firearms from a technological standpoint, the new products were far and few between and most “NEW” items were variants and accessorized versions of items previously announced. Overall, the atmosphere present was somewhat less energized than in previous years, in my humble opinion, no doubt from the global economic slowdown and the future of firearms with then to be, President Barack Obama. Despite a fairly large number of the manufacturers displaying a revamping of last year’s models, some truly new items were presented at this years show. Last year, our own Dean Roxby reported on the return of the Model 70 by Winchester due to popularity and of course profitability. While talking to the representatives at the Winchester booth, it became known that the Model 94 lever action is being brought back as well. 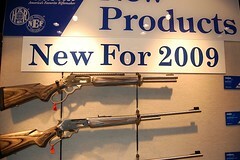 New production of the famous lever action could begin as soon as early 2010. O.F. Mossberg, renowned for its reliable and low cost model 500 shotguns, has now introduced a new trigger system. Very similar to the well known Savage Accu-trigger, the Lightning Bolt Action (LBA) Trigger System gives a crisp and easily adjustable trigger pull (2-7 pounds) and is standard in 2009 for bolt action models such as the 4×4 and the 100 ATR. The distinctive lightning bolt cutout easily identifies the equipped rifles and with a 100ATR with LBA usually having a MRSP of under $460USD, Savage may end up giving up a bit of market share. RCBS had a couple of new products to show but the one that truly caught my eye was their bullet feeder system for progressive presses. I was able to try it out at their booth and let me tell you that it functioned flawlessly for the few dozen sample rounds I cranked out. Talking to the representative, the idea was to actually compete with systems like the KISS and GFI bullet feeders that have been around for the last few years. The feeding package itself is very basic and simple, with a very simple low bullet visual indicator. At $500USD, it is only slightly cheaper than the aforementioned feeder kits, however the big difference is that the RCBS kit comes with all the components to feed bullets for 9mm, .357/.38, .40/10mm, and .45ACP. Capacity of the hopper is somewhat small however, with a capacity of 150-200 pieces. RCBS is working on a rifle version that will work for .224 & .308 bullets. The feeder is indeed a very nice piece of equipment. Pendleton Safe Company brought out several of their new firearms vault designs, and they are quite interesting in concept. Pendleton’s new rotating safes are innovative in that they use a concept, while old by kitchen standards, is relatively new in firearms storage. Through the use of a rotating storage system, similar to that of a Lazy-Susan, the rotating safe can hold many firearms for its size and allows very simple access to any single firearm. The safes actually have dedicated shelving for handgun storage as well. The smallest of these safes holds up to 24 long guns and 18 handguns with the optional racking, let alone the dedicated pistol version that holds up to 90 handguns. Some of the additional options include upgrades from the 3/16” construction material and electronic dehumidifiers. 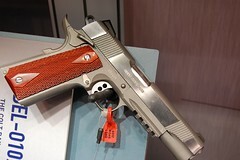 At the time of the SHOT Show, these were in pre-production stages and no retail prices were available. According to the representatives however, these safes will be available for purchase and delivery sometime in the fall of 2009. Marlin introduced a revamped guide gun for this year. The 1895SBL is a big-bore lever action chambered in 45-70 government, constructed heavily with stainless steel and totes several great features. Standard are the oversized loop, ghost ring sights, weatherproof laminated stock, and a full length mounting rail make this lever action a great addition to anyone’s collection. However, be forewarned that all these features are not free; the 1895SBL is just shy of ten C-notes at $978USD suggested retail. On the handgun side, one of the oldest names are finally getting onto the addition of a Picatinny rail onto their products. You may be as surprised as I was, to know that Colt Manufacturing, manufacturer of the venerable 1911, has just introduced the “Colt Rail Gun” as their first foray into the trend for mounting lights and lasers to handguns. The handgun displayed at the show was a stainless model based off the 1911 Government, and the model was designated as 01070RG. No MRSP was given and staffing at the booth was sparse and very busy so I did not hang around waiting for answers. After all, I only had a few days to go around and gather information and images. North American Arms, renowned for its mini-revolvers and small defensive firearms is in discussions with a Canadian company to see if a 4.25” version of their Mini-Master revolver is feasible and marketable inCanada. The Mini-Master is manufactured from stainless steel and is quite heavy for such a small pistol. Plans are to have the revolver come and a combo package with interchangeable five shot cylinders chambered in .22 LR and .22 WMR. MRSP has not been determined but is expected to be around $400USD. Now I am primarily a firearms enthusiast, and unlike some of our more rounded individuals, I have a very hard time getting excited by pellet rifles and other pneumatic powered firearms. 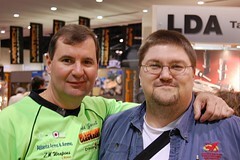 However during my travels across the miles of aisles, I happened to chance by the Demyan booth. Based out of Moscow, the Russian company is marketing a bullpup version of their T4 rifles. Unfortunately the representatives at the booth did not have very good skill with the English language and minimal information could be collected without dedicating a fair amount of time. It seems to be a very nicely made rifle though I question the mounting location of the pressure gauge which is directly under the muzzle of the rifle. MRSP was approximately $1300USD. Some of the new products introduced in the last few years were tweaked by the manufacturers or undergoing some design changes. 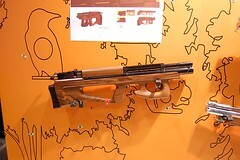 Examples include KelTec’s Rifle Forward ejecting Bullpup (RFB) which underwent a slight redesign and now ejects on the left side of the barrel in order to enhance spent cartridge extraction. Bushmaster’s ACR (originally designed by Magpul, and called the Masada) is undergoing some engineering changes so it can compete in the next service rifle trials for the United States Army in 2010. The main focus of the change happens to be the cheap looking, rattling, ambidextrous, charging handle, a suggestion that this author mentioned to Bushmaster & Magpul at last year’s SHOT Show. Who knew? While the economy was the one of the main discussions overheard, there were still a multitude of products that were for the eccentric and higher end retailers. While Ruger full frame revolvers no longer sport the trademark rose-wood insert grips as cost saving measures, companies like Technoframes are selling custom high quality ammunition cases. One such case is a fully machined aluminum block with a clear plastic magnetically secured lid that holds fifty rounds of .357 magnum. Retail price is only a paltry $150USD without engraving. Obviously the show caters to ALL demographics. For visitors of the show who are there to look at the new products and be awed by the sheer size of the event, let me share some of the highlights I got to experience. My most appreciated moments during the show were being able to interacting and chat with such notable names as Todd Jarrett, Angus Hobdell, Jerry Miculek and of course the Gunny himself, R. Lee Ermey. Sometimes being associated as media can be a good thing. As was mentioned in previous reviews of the SHOT Show, the annual gathering hosted by this author allowed for members of the CSSA and Canadiangunnutz to get together and socialize. While the size of this year’s gathering was limited to only a few individuals and their families, it is hopefully the beginning of a long tradition. I would recommend trying to attend the SHOT Show at least once, even as a guest of someone else, as the experience is eye opening. After all, according to the website, the SHOT Show is the world’s premier exposition of combined firearms, ammunition, archery, cutlery, outdoor apparel, optics, camping and related products and services. What is there not to like? 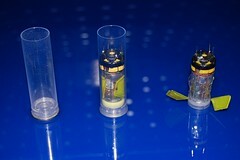 The new long range taser cartridge.